Waking up in a beautiful little house the middle of a secret island sounds like a fairytale. However, you can experience this kind of morning when you have vacation in Indonesia. There are many secret islands you can visit and stay in for few days. This is where you can enjoy the most of your life since everything looks amazing and dream-like. Indonesia has many hidden gems you can visit anytime. Water villas and bungalows are now getting popular. In maritime country like Indonesia, this can be opportunity to attract many tourist from different countries. Ora Beach Resort in Maluku is one of the best water bungalows in Indonesia located in Maluku. The journey is quite tough to reach the location. However, it will be worth it. The water bungalows are situated in the seclusion of mountains and forest. It makes you forget the tough journey you went through before. There are only five water bungalows in this place. Therefore, you need to book in advance. The view of the mountain and forest is priceless and you can also enjoy swimming and snorkeling in clear sea waters. Pulo Cinta Eco Resort is situated in Gorontalo. This is great place to spend romantic getaway with your partner. There is also a story behind this tiny private island where the prince of Gorontalo and the daughter of Dutch trader conducted their forbidden love affair. This is place where you can revamp your romance. 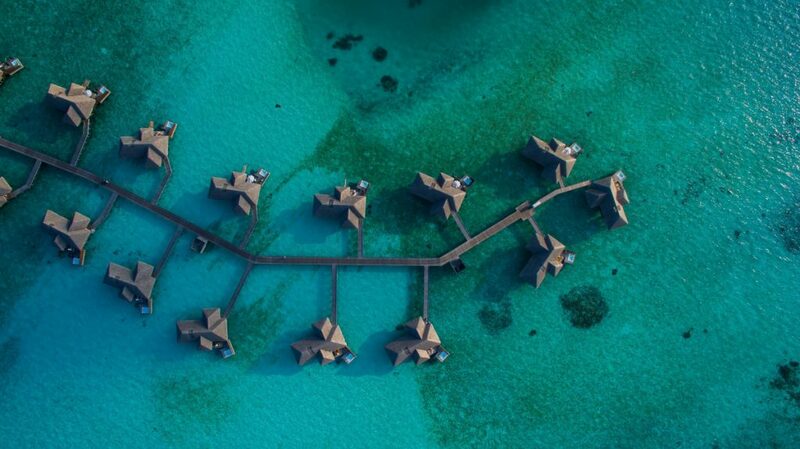 The water villas are arranged into heart shape which looks fascinating from afar and above. There are many fun activities to fill in your vacation such as diving, stargazing, and having candlelight dinner on the shore. Papua Paradise Eco-Resort is situated in Raja Ampat. Water bungalows in this resort will make you feel like living in the past when technology was sacred. There is spacious veranda in every bungalow. Besides, the bungalows come with unique design and the finest traditional materials from Raja Ampat itself. You can enjoy the view of Pacific Ocean through the veranda. You can do many activities include diving and indulging your taste buds with great buffets of various foods made of fresh local products. Telunas Resorts Private Island is located near Batam. There are total of 15 water villas here you can book in advance. Every villas is designed to provide comfort with see-through windows in the living room. Thus, you can perfect view of the island. There is also infinity pool to enjoy while watching beautiful landscape. You can also try free jumping from a dock jumping. Other fun activities include standup paddle boarding, tour through a mangrove river, kayaking, etc.